Len Rutledge is delighted to find the city changes quickly to country as they travel southwest from Townsville, north Queensland on the Flinders Highway. Anthills replace houses and cattle are more common than people. We climb the range and turn into tiny Mingela. Once known as Cunningham, then Ravenswood Junction, it became Mingela in 1930 from the aboriginal name of Ming-illa meaning big waterhole. There are still waterholes around and birdlife is prevalent during the wet season but most interest today settles on the quintessential outback Mingela Hotel. We call in to see the historic photos and chat with some locals. It is all very laid-back. It is 40 kilometres southeast from here along an excellent bitumen road to Ravenswood. Gold was discovered here in 1868 and soon the thriving town had schools, hospitals, police station, courthouse, School of Arts and 48 hotels. The railway arrived in 1884 but by then the town was already in decline. There was a big revival around 1900 but when the line closed in 1930 most thought Ravenswood's demise was imminent. The town was saved with the arrival of Carpentaria Gold. The best town information is obtained from the great Courthouse Museum. The museum, in a lovingly restored building from the 1870s, contains many artefacts and stories of the people who made Ravenswood. We plan to stay the night so check into the Imperial Hotel. 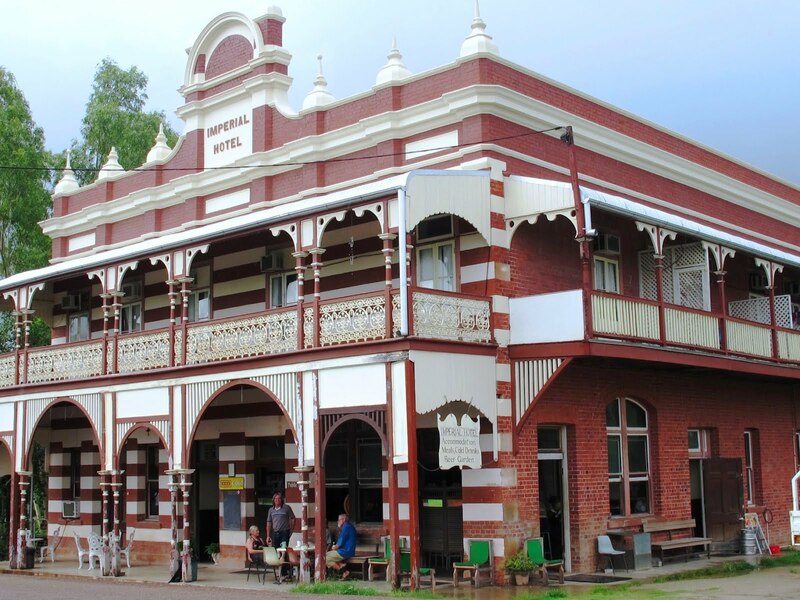 The striking two-storey brick hotel survives from 1901. The interior has been renovated but not remodelled and we find attractive period accommodation. We take our lunch in the bar at the front right of the building. Structurally, it's a circular bar with a large ornate divider. In the early days, the bar was split into workers and employers sections but this is long gone. The batwing doors, the incredible high ceiling and the old stained glass make this a special place. The Burdekin Dam is about 80 kilometres from Ravenswood. The excellent road winds its way deeper into the Leichhardt Range. We reach the dam and find picnic areas, wood BBQs, tables, shelters, toilets and cold showers. To fish in the dam you need a permit and these are obtained from the Queensland Government Gateway or from local tackle and fishing shops. The caravan park has good facilities and gets very busy in holiday periods, as the dam is also a popular spot for canoeing, sailing and waterskiing. Ravenswood has its own caravan park, tennis court, barbeque and picnic area, swimming pool, church and golf course. It's fun to wander around the area and we were fascinated by the historical display and the local pottery and crafts in the historic Thorp's Building. Before leaving we visit the White Blow Environmental Park where there is a spectacular outcrop of white quartz and a viewpoint over the operating mine. It is a fitting end to quite a fascinating visit. Imperial Hotel, Macrossan St., Ravenswood. Tel: 07-47702131. The hotel has air-conditioned country-style rooms, a friendly atmosphere and a kitchen open all day. Courthouse Museum Ravenswood. Tel: 07-47702047. Open 11am – 1pm daily.